Manufacturer/Importer: Meijer Distribution Inc., of Grand Rapids, Mich. 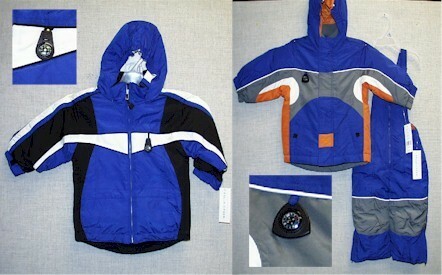 Hazard: These snow suits and jackets have decorative compasses and corded zipper pull tags that can come off, posing a choking hazard to young children. Incidents/Injuries: The firm received one report of a young child who removed the decorative compass from a jacket and placed a plastic piece in her mouth. No injuries have been reported. Description: The children’s snow suits and jackets were sold in children’s sizes 2T through 5T and 12M through 24M under the brand name, “Falls-Creek®.” The two-piece snow suits included a jacket and overalls. Both clothing items have a small compass attached to the front of the jackets and were manufactured in a variety of colors. The care label bears RN# 48711. Sold at: Meijer retail stores in Michigan, Ohio, Indiana, Kentucky and Illinois from August 2004 to October 2004. The snow suits sold for between $15 and $43. Remedy: Consumers can cut off the compasses and corded zipper pull tags from the zipper pulls, or return the recalled snow suits and jackets to Meijer retailers for a refund. Consumer Contact: Call Meijer toll-free at (866) 280-8419 anytime of visit the firm’s Web site at www.meijer.com.